A nostalgic trip down memory lane featuring our favorite oldies party tunes from the 50's and 60's performed by J.R. & the Stingrays, break out your dancin' shoes and make peace with your gods baby cause' it's time to Rock n Roll! 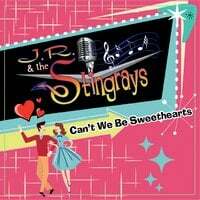 J.R. & the Stingrays are a Boise-based oldies rock and roll band established in 1985. They perform a Sha-Na-Na style oldies show with a vintage flair reminiscent of the American Graffiti era. The Stingrays cover tunes from Bill Haley & the Comets, The Drifters, Beatles, Elvis and many other great rock and roll artists of the past. The Stingrays are best known for their oldies Rock ‘n Roll and Doo-Wop style emulating the great harmony bands of the sock-hop era. Their retro-nostalgic music style caters to music lovers of virtually every age group. Every song in their set list has to pass the band's strict "C.D.I." test (Chicks Dig It) and bring the crowd to the dance floor. Back in the early 90's, the Stingrays took their oldies music to a whole new level by promoting the band as "the real deal" for the local oldies fans. The Stingrays were often featured as an opening act or backing musicians for famous groups in the oldies genre. They were regulars of oldies radio special events and concerts. The Stingrays were constantly on the road playing corporate shows, concert venues, casinos, car shows and music festivals all over the western United States. With the dawning of the new millennium, The Stingrays have expanded their reach. Since 2012 the Stingrays have been traveling the world featured as the House Band on the popular oldies themed cruise hosted by Paul Revere's Raiders. The "Where the Action Is" Cruise on Princess Cruise lines brings fans from across the globe. J.R. & the Stingrays have the distinct honor of backing national headliners such as Gary Lewis, Charlie Thomas' Drifters, Marshal Lytle of the Comets, the Hollies, The Classics IV and many other touring acts as well as being featured headliners themselves. According to the Stingrays, "This album was a true labor of love that we recorded for our dedicated fans; we would not be where we are today without their love and support over the past 30-something years. We are looking forward to many more rockin' years to come."